The Samson AirLine Wireless Guitar System features the AG1 transmitter and AP1 pedal-style receiver. This wireless system works perfectly with your Gibson guitar or bass. 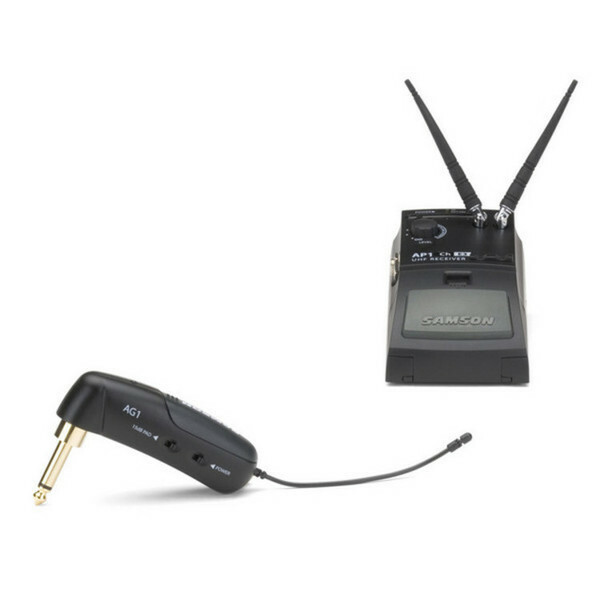 Taking wireless connectivity to a new level, the transmitter and receiver are so small and lightweight, with no cables or beltpacks. The AG1 transmitter features a Power On/Off, red/green LED for Power On/Off and an Input Level control for different pickups. Along with UHF (Ultra High Frequency) means clearer frequencies with less interference. The AP1 pedal receiver provides reception you can always depend on and is designed for use with compact effect pedals. The AP1 features a 1/4" output jack, Power switch, Peak LED and a Volume control. Wireless reception and sound quality are significantly improved with the Samson AG1/AP1 propriety technology featuring miniaturized circuitry. This wireless guitar system offers a 9 volt battery or an AC adapter to power the receiver, when you unplug the unit the battery is disabled to conserve power.